for workers in the US since Jan 2017. Poké restaurants are all the rage these days and offices across the United States and now offices are enjoying these bowls as, since the start of 2017, ZeroCater has seen a 76 percent increase of poké meals delivered from poké meals delivered in 2016. 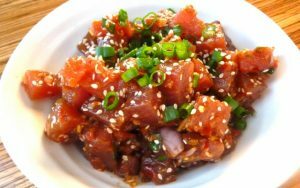 At the end of 2016, industry experts predicted poké would have a significant influence on the restaurant space in 2017 with menu additions and new concepts. One factor may be a focus on health in the workplace. Poké is full of flavor, low in calories and high in protein, with sushi-grade seafood boasting essential fatty acids, which are great for maintaining brain function, cardiovascular health and healthy cholesterol levels. With clients’ increased interest in poké, ZeroCater brought on five new poké vendors to accommodate demand, including Pokéworks in the San Francisco Bay and New York regions. Viktoria Darabi is a Food Culture Tourism Whisperer, Food & Beverage Trendspotter & Futurist, championing the power of food culture activities to celebrate multi-culturalism, promote social cohesion, engender a sense of community pride and to transform or construct ‘place’ to define a destination’s identity and distinctiveness. This entry was posted in Gastronomia and tagged Food Trends, poke by admin. Bookmark the permalink.